For more than 100 years, conventional light microscopes have been vital tools for pathology. However, fine-scale details of cells cannot be seen with these scopes. The new technique relies on an approach known as expansion microscopy, developed originally in Edward Boyden's lab at MIT, in which the researchers expand a tissue sample to 100 times its original volume before imaging it. "It's a technique that could have very broad application," says Boyden, an associate professor of biological engineering and brain and cognitive sciences at MIT. He is also a member of MIT's Media Lab and McGovern Institute for Brain Research, and an HHMI-Simons Faculty Scholar. In a paper appearing in the 17 July issue of Nature Biotechnology, Boyden and his colleagues used this technique to distinguish early-stage breast lesions with high or low risk of progressing to cancer—a task that is challenging for human observers. This approach can also be applied to other diseases: In an analysis of kidney tissue, the researchers found that images of expanded samples revealed signs of kidney disease that can normally only be seen with an electron microscope. 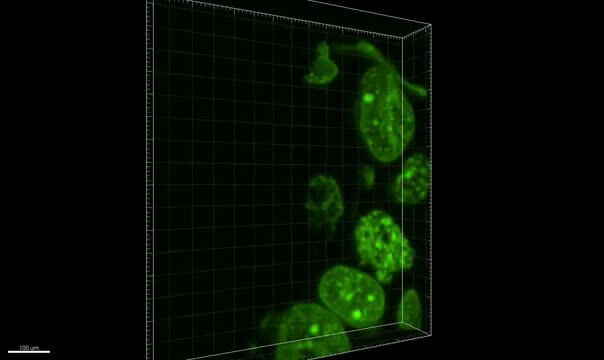 "Using expansion microscopy, we are able to diagnose diseases that were previously impossible to diagnose with a conventional light microscope," says Octavian Bucur, an instructor at Harvard Medical School, Beth Israel Deaconess Medical Center (BIDMC), and the Ludwig Center at Harvard, and one of the paper's lead authors. MIT postdoc Yongxin Zhao is the paper's co-lead author. Boyden and Andrew Beck, a former associate professor at Harvard Medical School and BIDMC, are the paper's senior authors. "A few chemicals and a light microscope"
Boyden's original expansion microscopy technique is based on embedding tissue samples in a dense, evenly generated polymer that swells when water is added. Before the swelling occurs, the researchers anchor to the polymer gel the molecules that they want to image, and they digest other proteins that normally hold tissue together. The researchers tested this approach on tissue samples from patients with early-stage breast lesions. One way to predict whether these lesions will become malignant is to evaluate the appearance of the cells' nuclei. Benign lesions with atypical nuclei have about a fivefold higher probability of progressing to cancer than those with typical nuclei. "These two types of lesions look highly similar to the naked eye, but one has much less risk of cancer," Zhao says. 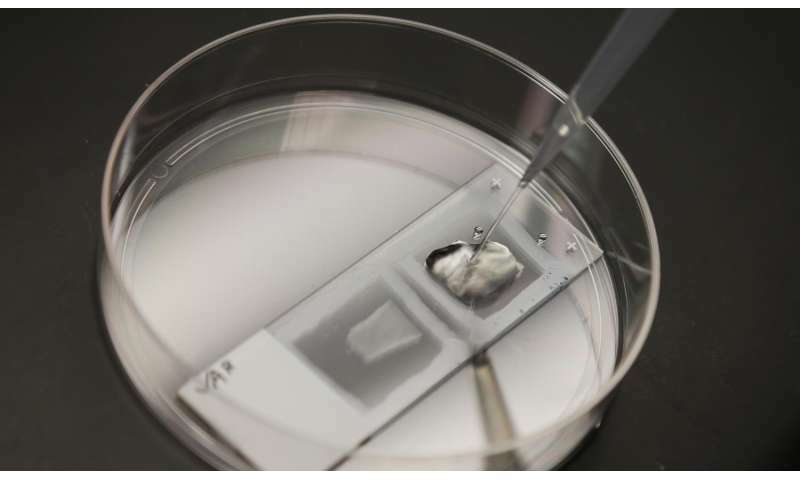 The researchers also analyzed kidney tissue samples from patients with nephrotic syndrome, which impairs the kidneys' ability to filter blood. In these patients, tiny finger-like projections that filter the blood are lost or damaged. These structures are spaced about 200 nanometers apart and therefore can usually be seen only with an electron microscope or expensive super resolution microscopes. "Now you can diagnose nephrotic kidney disease without needing an electron microscope, a very expensive machine," Boyden says. "You can do it with a few chemicals and a light microscope." "If you can expand a tissue by one-hundredfold in volume, all other things being equal, you're getting 100 times the information," Boyden says. Scientists could also look at the architecture of the genome, or at how cell shapes change as they become cancerous and interact with other cells of the body. Another possible application is identifying proteins that are expressed specifically on the surface of cancer cells, allowing researchers to design immunotherapies that mark those cells for destruction by the patient's immune system. "Cancer biopsies are just the beginning," Boyden says. "We have a new pipeline for taking clinical samples and expanding them, and we are finding that we can apply expansion to many different diseases. Expansion will enable computational pathology to take advantage of more information in a specimen than previously possible." Humayun Irshad, a research fellow at Harvard/BIDMC and an author of the study, agrees: "Expanded images result in more informative features, which in turn result in higher-performing classification models."